Average Height	: 25" - 30"
Average Weight	: 50 - 85 lbs. The greyhound were originally bred for hunt small game, deer, foxes and hare. This has additional names as well: English Greyhound. The dog breed Greyhound is classified as Sighthounds, and has been used as a hunter. **Sighthounds may also be known as Gazehounds. This dog breed have intermediate IQ in contrast to other dog breeds. The dog breed is a hypoallergenic pedigree dog. For allergy sufferers, a hypoallergenic pet might enable them to have a pet in their home. They are not completely non-allergenic, but they will make life easier for people with allergies. Greyhound cause less concerns with shedding in contrast to other breeds. The Greyhound's demands wonderfully little brushing. These dogs have intermediate energy in contrast to resembling dog breeds. The dog breed have a intermediate need for exercise. The Greyhound's may be a bit reserved, aloof and wary of unknown persons. They are commonly friendly with other dogs. They are children friendly and good with kids. The Greyhound have a tendency to act like a predator. They will show exaggerated predatory tendencies from time to time. This dog breed do not bark exaggeratedly. The Greyhound can handle wonderfully hot tempetatures. However, they do need to drink water just as any other dog. This dog breed is known to be wonderfully playful. These dogs should be kept on a leash as they tend to wander if kept loose. Greyhound Health issues: Regrettably, some Greyhound's may attain dangerous health concerns. This dog breed tend to bloat (also known as stomach torsion and twisted stomach). The scientific term for the disease is Gastric Dilatation and Volvulus. The stomach can easily rotate on itself when filled with air. Greyhounds make great pets! They are intelligent, affectionate, “laid back” and exceedingly clean. Although they are classified as large dogs, they are relatively unobtrusive, polite, and easy to live with. Male Greyhounds average between 65 and 80 pounds; females are a little lighter and shorter at 50 to 65 pounds. Some Greyhounds do well with cats and other small animals, while some need to be the only dog or animal in the home. Most are also good with children. Most Greyhounds are not natural barkers, but can, on occasion, pickup a barking habit if another dog in your house is a frequent barker. Greyhounds have virtually no “doggy” odor, even when wet. They have short hair, do not shed much (though they do shed a little), and do not require grooming other than an occasional bath, brushing and nail clipping. Greyhounds do not eat a lot, about 4 cups of dry kibble daily, but do need a premium dry dog food. A good quality lamb and rice formula without corn or soy is generally a good choice. Greyhounds are generally very healthy dogs, and live for 12 to 15 years. Hip displaysia and other genetic defects are very rare in ex-racing Greyhounds, due to their careful, selective breeding for speed and stamina. Health problems are minimal compared to other breeds, although tick borne diseases are a potential health risk, due to their nationwide travels as racing dogs. The biggest adjustment any potential adopter should be aware of however, is that Greyhounds, due to their low body fat, require special anesthesia procedures whenever called for. Greyhounds do not need a lot of exercise, but will enjoy as much as you have time to give them. A good run in a fully fenced field once a week will help keep your Greyhound fit and happy. 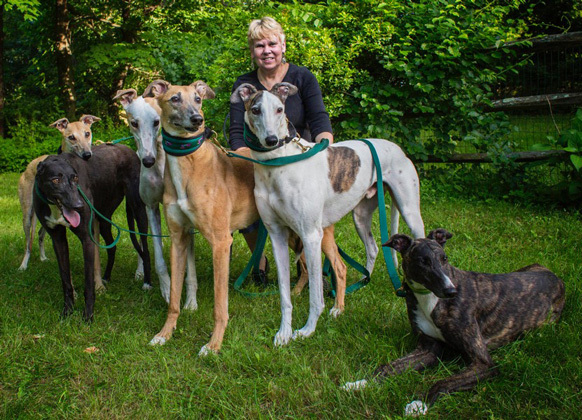 By being trained during their racing career for good “leash manners”, your Greyhound will love to go for walks, and both you and your dog will benefit from walking as often as possible. Racing Greyhounds are trained for sprinting short distances, but can easily be conditioned as ideal jogging companions. Again, they are not overly hyperactive dogs, and will be content to follow you from room to room in your house, as well as snooze for up to 18 hours a day, as well as be a companion on walks. Greyhounds are members of the sighthound group, and have exceedingly keen eyesight — they can see clearly for up to one-half mile! They also have a genetic chase instinct and a love for running. This combination of genetic traits, plus their racing training, makes it necessary to keep your Greyhound on leash when not inside a completely fenced area. Greyhounds hunt by sight, not by smell, and if they become lost are very unlikely to find their own way home. Greyhounds have very little body fat (less than half that of other breeds), thin skin, and short fur. Thus, they are sensitive to heat and cold, making them strictly indoor dogs. Fortunately, their unusual sense of cleanliness and lack of odor make them excellent indoor canine companions. •	Low Barker. Can be aloof. should be considered by pet loving owners. •	Low shedders, almost hypo-allergenic. •	Should be given lots of exercise, they are 'runners', but easily adjust to a life of relaxation.
. Comparatively low separation anxiety vs. most other breeds.
. Greyhounds also enjoy relaxing and living with minimal exercise, believe it or not! •	Sweet, calm, can live in small spaces easily. •	Too sweet to be a guard dog. •	Can develop bloat [Stomach gets twisted]. Unless you're a rabbit, greyhounds are among the most gentle and calm dogs with your family or strangers. They are generally not interested in the affairs of people unless there is a chance they'll be let outside for some running. Quite intelligent, the greyhound is able to pick up training rather quickly. The racing industry has had a profound effect on the breed, with many dogs having been bred for speed and the ability to remain calm in the crate before being sprung for a race. As such, while there may be many disorders that plague this breed in old age, they usually are very good with people, though not always friendly in the traditional sense of the word. Greyhounds are usually quite good with other dogs, and former racing dogs have already been well socialized while young. If you buy a greyhound pup you'll have to do that yourself, but they seem to readily accept the company of other dogs. The breed is surprisingly good with children, and greyhounds tolerate a great deal of shenanigans from older children without problem. Being somewhat fragile, they are leery of roughhousing and will simply get up and walk away from a situation they deem dangerous. Very young children may find themselves chased due to their high pitched squeals that sound more like wounded animal than a human being. Barking is usually not a major problem, as this too has been carefully bred out of the dogs, though they often bark and yip when confined too long or are chasing prey. In a household situation they make terrible guard dogs since they're simply too relaxed to care much what humans are doing. Generally speaking greyhounds are healthy dogs, in no small part because they have to be. Sadly, the greyhounds bred for racing have several ailments, many of which don't appear until later in life. The typical racing career of these dogs is just a few years, so they have been bred for many generations in the United States, Great Britain with only the first few years of their lives in mind. Show dogs are often healthier as a general rule, but may actually be a bit higher strung. Hip and joint disorders: hip dysplasia is a somewhat common disorder that can strike dogs as young as 3-4 years, though is more common over 5. There is very little that cane be done for this genetic disorder other than trying to prevent it through gentle work when the dog is still a pup. Broken bones: Greyhound bones are quite delicate for such a big dog. They can harm themselves by too vigorously chasing something over rough terrain. If your dog is limping, get him or her to the vet for an immediate exam. A common effect: Chemical sensitivity means your dog could break out in hives after bathing or after flea treatment. Consult a vet before administering sub-dermal chemical flea and tick control. If you put a flea collar on your dog, be sure to check and make sure they're not reacting badly to it. Baby and puppy shampoos can usually be used without problem, though your greyhound is unlikely to need more than the annual bath. Though the problem is rare,most greyhounds are fed small meals several times a day to avoid Bloat,the painful twisting of the stomach that can accompany especially large meals. Keeping a greyhound well groomed is very simple, since their coat is so fine and thin already. In fact, a simple rub with a hound cloth or a quick combing with a rubber comb to stimulate the skin will be much appreciated every week or two. These dogs love to run. While they are famous as couch potatoes when indoors, they get the bug as soon as they go outdoors and you will have to take special care to train them to leash walking without pulling you along for the ride. Since they are usually easy with other dogs they do very well in dog parks with off-leash areas. Here, they can carouse with other dogs and really enjoy their ability to outrun every other member of the pack. Many people also take them for a run while they pedal a bicycle. This is usually a fine form of exercise, but care must be taken to not injure the dog, as hey can be a bit spindly. Their paws are also very small and very frequent running on asphalt can damage the pads. It's a good idea to inspect their feet regularly and perhaps get them booties for protection. The training of a puppy differs greatly from the training of a retired racing dog that one may adopt, though they still have to learn many of the same things. For instance, the organizations that train dogs for new homes after racing careers often have to teach them how to climb stairs, though they seem to take to furniture readily. Both will likely have to be housebroken, too. This is usually fairly quick for the adult dog, though greyhound puppies take to it very quickly, too. Older dogs that do have some difficulty often respond to the crate training they should have already mastered in such situations. Be sure the crate is plenty big so your dog can turn around without having to compress his or her spine to do it. They tend not to bark very often at all and can easily be trained out of it if the trait develops as a pup. Usually taking your greyhound for a walk is enough to get all the pent up energy out of their systems and defuse the bark. While they are generally good with other dogs, when the pack is larger then four or five dogs, they can be some conflict, especially among males, though females are by no means exempt. You can work on this with your dog by using a "turning out muzzle" and rewarding good behavior. Though greyhounds can be a bit stubborn at times as far as training goes, but they do usually want to please their owners. Though not particularly protective to the family group, they are loyal and often bond to family members in very short order upon arrival.